We manufacture and exports the wide range of automatic voltage stabilizer, servo voltage stabilizer, three phase voltage stabilizer and voltage stabilizers. The efficiency of power make stabilizers is more than 98-99% in comparison to 93-97% of conventional make available in the market depending upon the input voltage range. Thus, a 500 KVA conventional type stabilizer or conventional servo voltage stabilizers will consume additional power itself minimum Rs. 80,000 p.a. (even when running at 60% load and 20 hours a day) on account of its lower efficiency by 2%. The life of make servo voltage stabilizers is more than 10/15 years at full load in comparison to 2/3 years of conventional make. Conventional type stabilizers are suitable for 30-40% load on continuous duty cycle. 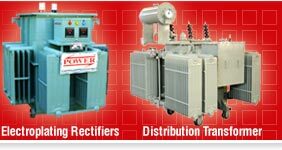 Our automatic voltage stabilizers are Heavy Duty & Industrial type and are suitable for 100% load continuous duty cycle. For running load of 200 KVA, generally 400 KVA / 500 KVA conventional type stabilizer is installed while make 200 / 250 KVA is suitable. Our automatic voltage stabilizers are guaranteed unconditionally for 5 years as compared to 1 year of conventional make. Owing to its high efficiency and associated benefits, the payback period for the cost of POWER'S Servo Voltage Stabilizers is from 6-12 months depending upon the input voltage variation and number of working hours of the plant. The HIGHER the input voltage the SHORTER will be the payback Period. We have all India servicing network to provide immediate service to our customers. The Service Engineers also visit monthly in their respective areas for routine check-ups. 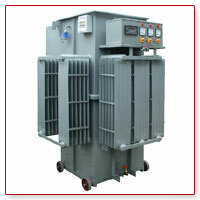 Also, servo controlled voltage stabilizers are categorized under ENERGY SAVING. The servo controlled voltage stabilizers should be such that its own consumption is minimum otherwise the basic concept of Energy conservation will be lost. Therefore while deciding for a stabilizer it becomes necessary to invest the capital over a period of time to ensure that its running cost is minimum and payback period is quickest. From the above facts, you will find that our automatic voltage stabilizers will cost much lesser in long run to conventional type stabilizers. Automatic Voltage Controllers and Automatic Servo Voltage Controllers are designed for max. 35-40 degree temperature rise at top of oil whereas allowed limit is 50' C.
The core is constructed from low loss, cold rolled, grain oriented, annealed laminations of electrical sheet steel conforming to the latest international standards. Special frame is built in-house for clamping the core to reduce the magnetic noise as well as making the whole structure rigid and robust. Coils are wound with paper covered electrolytic grade copper strip or synthetic enameled copper conductors. Cooling ducts are provided to keep the hot spot temperature as low as possible. Coils are dried in electric ovens. Rigid connection support and coil clamping is provided to ensure high short circuit strength. Pre-compressed board PARMALI board and JAPANESE insulation paper of best quality is used. Oil tested for resistivity, dielectric and acidic characteristic conforming to IS 335. Before topping up oil is filtered throughly. The tanks are made of M.S. steel plated / sheets with adequate bracing & stiffness. All the external surfaces are given a primary coat of Epoxy and finishing coat of Epoxy paint for better life. AE meters and quality products for controls are used. In the Conventional Dimmerstat of 100 Amps. current, winding is done by 10 mm2 approx. copper wire, while in our voltage regulators of 100 Amps. use copper strip of cross section area 20 mm2 copper. That means our copper area for the same voltage input regulators is double than that of dimmerstat used by other manufacturers. 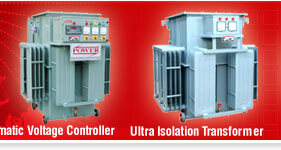 In the voltage regulators manufactured by us, the roller moves on both sides of the coils i.e. in one direction, it increases the voltage and in the other directions it decreases the voltage. In conventional dimmerstats brush moves in only one direction, requiring double capacity dimmerstat than used by us. Since the power losses of electrical equipment are directly proportional to the square of the current drawn by it. For above case the losses in conventional dimmerstat are four times because of lesser copper size and with double the sizes of dimmerstat, the losses become eight times more than the losses of our voltage regulators. 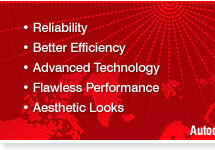 Because of this fact the efficiency of our stabilizer is more than 98% compared to less than 95% of other manufacturers. In dimmerstat the carbon brushes slide over the winding and tend to wear off, thereby causing deposition of carbon in between winding. uses Carbon roller assembly instead of brushes which have negligible wear and carbon deposit on the track is minimum.